In the Category Best Alphabet, the Oscar goes to …. Gotta love a good alphabet. 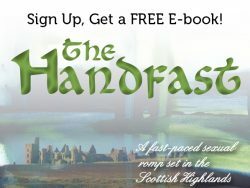 This is a repost of a blog on Goodreads from June, 2014. I was put in mind of it because I just watched My Happy Family, a film on Netflix that takes place in Tblisi, Georgia, which I visited in June, 2014. I loved the movie. Note: The buildings in Tblisi are known for their balconies and I particularly loved the scenes that featured them (from the inside, whereas my perspective had always been from the outside). 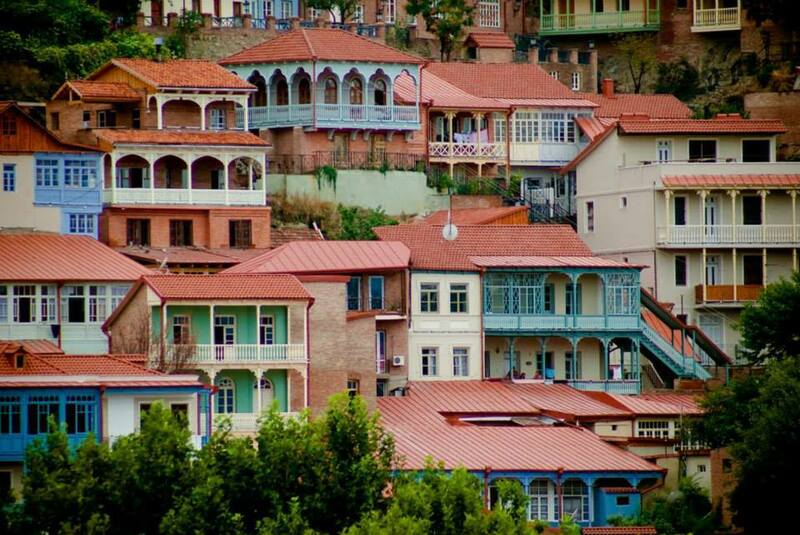 Balconies of Tblisi. The ones in the movie are not as picturesque. 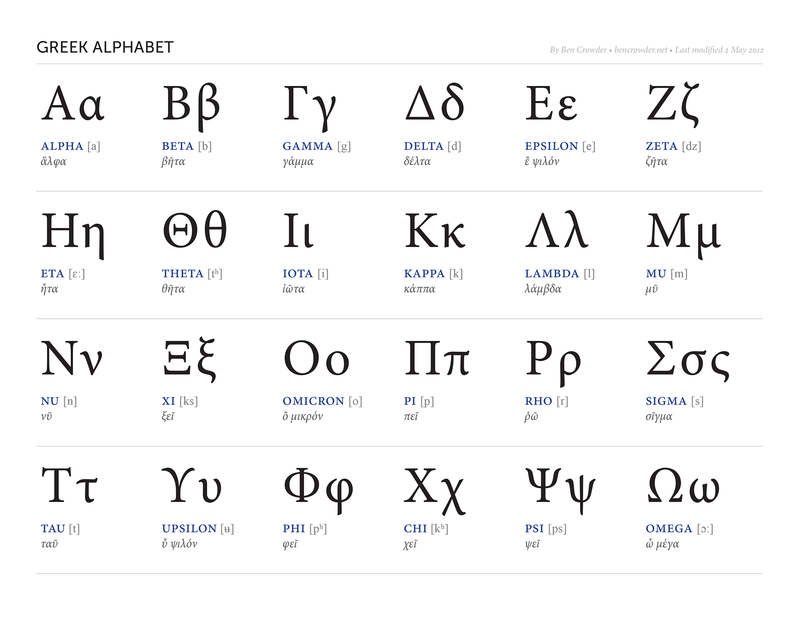 Greek – the original, the one the term alphabet is named after, namely from the first two letters of the Greek alphabet: alpha and beta. The earliest inscriptions date from the 8th century BCE. It is written left to right. Currently starring in: writing Modern Greek, the names of American fraternities and sororities, and some symbols in math and physics. Arabic – like the Greek alphabet, the Arabic alphabet is derived from an earlier Phoenician syllabary, which was, in turn, based on Egyptian hieroglyphs. The Arabic alphabet makes its first appearance around the 4th century CE and is more accurately an abjad, where only consonants and vowel length are represented (no vowels). It is written right to left. 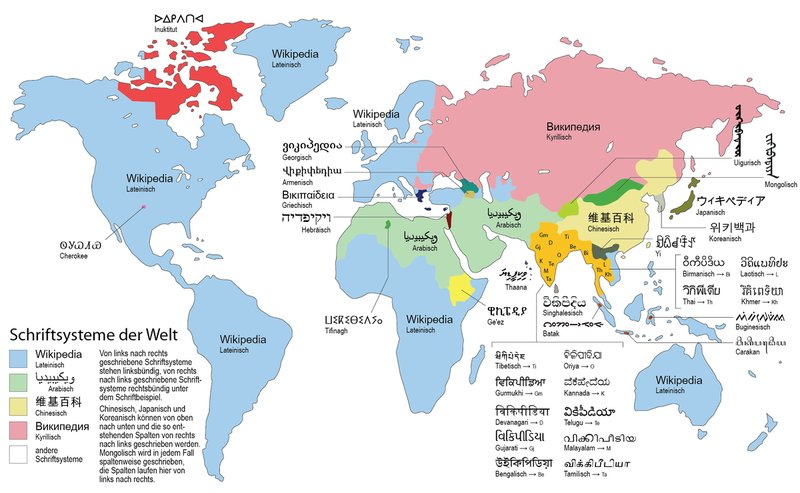 Currently starring in: writing Modern Standard Arabic and non-Semitic languages whose populations are Muslim: Farsi (Persian) and Urdu, both of which are Indo-European, being notable examples. Cyrillic – inspired by the Greek alphabet and created by Saints Cyril and Methodius in the 9th century CE. It is written left to right. Currently starring in: writing Slavic languages whose populations are traditionally Eastern Orthodox: Russian, Ukrainian, Belorussian, and Serbian (the Poles are Slavs but Catholic and write in the Roman alphabet); writing non-Slavic languages spoken in parts of the former Soviet Union, such as Kyrgyz, a Turkic language, and Tajiki, an Indo-European language; and writing a non-Slavic language whose population was affected by socialism, namely Mongolian, a Mongolic language. Today Kazakh and Uzbek, both Turkic languages spoken in former Soviet Socialist Republics, are in the process of shifting from Cyrillic to Latin. Azeri, another Turkic language spoken in a former SSR, namely Azerbaijan, switched from Cyrillic to Latin over twenty years ago. 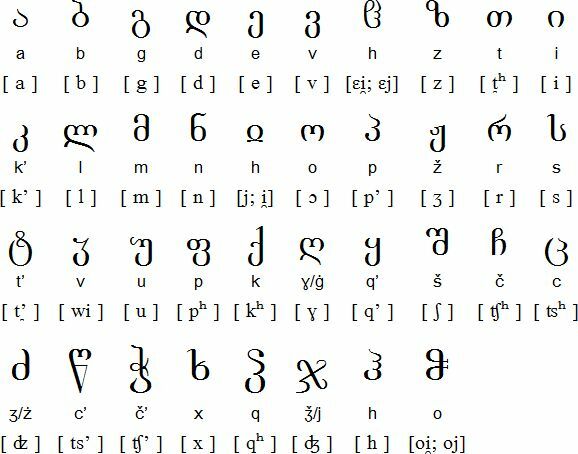 Mongolian is making a push to restoring the alphabet used by Genghis Khan. Point here: alphabets are not neutral instruments of communication. Alphabets are highly political. 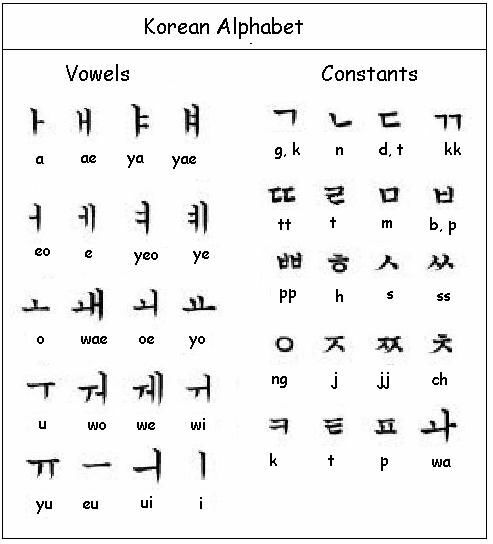 Hangul (Korean: Great Script) – developed in the mid-fifteenth century for Korean by King Sejong but not in widespread use until the twentieth. It is used in both North and South Korea. It is written left to right in stacked syllables to mimic the visual complexity of Chinese logograms. Hangul is a particularly strong contender. It is considered the world’s most perfect alphabet, because the shape of the symbols represent articulatory gestures. For instance, the graph ㄴ [n] gives a left-facing sagittal view of the oral cavity, with the tongue making contact with the alveolar ridge behind the teeth, in order to produce the sound [n]. Georgian – earliest surviving inscriptions date back to the 4th century CE, but there is evidence it has been in use since the 3rd century BCE. It is written left to right. Currently starring in: writing Georgian. In the capital, Tbilisi, signs are written in one of three ways: i) with the Georgian alphabet alone; ii) with the Georgian alphabet transliterated into Cyrillic below and in one-to-one correspondence; iii) with the Georgian alphabet transliterated into Roman below and in one-to-one correspondence. This year’s nominees were particularly strong: Greek is venerable, Arabic beautiful, Cyrillic muscular, and Korean sophisticated. The voting members were, however, particularly impressed with Georgian. Where [d] is D in Roman, د in Arabic, Δ/Д in Greek/Cyrillic, and ㄷ(t/d) in Hangul, Georgian digs deep and turns corners characters in the other alphabets do not dare: დ . Did not see that one coming! Then there’s [h] which comes out H in Latin, ه in Arabic, Χ/Х in Greek/Cyrillic, ㅇin Korean – and, once again, Georgian turns those unexpected corners with: ჰ . So, the Oscar goes to … the Georgian alphabet. Georgia now needs to clear a place on its mantel to display this significant honor.